1500-1530 on 11760 HAB 100 kW / non-dir to CeAm Esperanto Sun is on air??? 1500-1800 on 11760 HAB 100 kW / non-dir to CeAm Spanish, Sun from 1530??? 2230-0600 UTC it is Maintenance day at our transmitter site Rangitaiki. 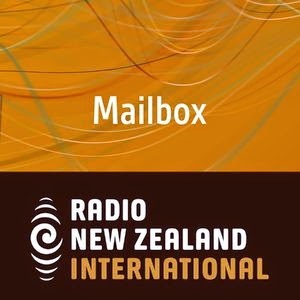 Sad to say that the RNZI Mailbox program is ending on August 4 after 65 years of service to international radio listeners. Funds are being redirected into the core Pacific news and information services that are actually directed at the target audience for which RNZI is funded. This will strengthen RNZI's services to the Pacific. RNZI Mailbox is broadcast fortnightly, so the penultimate edition is today (Monday) at 1130, 1330 and 1630 UTC; plus tomorrow at 0330 UTC. The current shortwave schedule of Radio New Zealand may be found here. Radio Nord (Sweden) plan to transmit on medium wave and shortwave on 23rd August as part of the Radio Day to celebrate 100 years of the Vaxholm Radio coastal station (on an island in the Stockhom archipelago) which opened in 1914. Radio Nord (Revival) is a tribute to the former sixties Swedish offshore station and plan to have a studio set up at Vaxholm Castle for the event which is open to the public for any members in Sweden. Full details in programme may be found here. Frequencies mentioned in the "Radiodag" programme are 1512 kHz and 6065 kHz for Radio Nord. "We will definitely be broadcasting on MW 1512 kHz but the SW frequencies have not yet been cleared. Also, you may expect test transmissions earlier in the week as our license is valid for two weeks. We also expect to have a smaller SW transmitter operating from the actual Castle, in addition to the 10 kW from Sala. Also, you may look for us in the 75 m.b. where we will be using 5 kW from Sala if everything works out. Frequency should be 3915 kHz." Radio City will be on the air this coming weekend, on Friday July 18th at 18 - 19 UTC via IRRS on 7290 kHz and Challenger Radio on 1368 kHz, with an additional transmission (during the summer) via Challenger Radio at 21 - 22 UTC, then repeated on Saturday July 19th at 09 - 10 UTC via IRRS on 9510 kHz. Old programmes may be used by IRRS as fillers at random. Radio City is also on the air via Hamburger Lokalradio Saturday July 26th at 12 - 13 UTC on 7265 kHz. Radio City is also aired every Saturday at 19 - 20 UTC on 1485 kHz by Radio Mercurs, Riga, Latvia. Saturday, HLR programs will be running as normal on 7265 & 6190 KHz. European Music Radio will return on the 3rd Sunday of September 2014. "It is with regret that SW Radio Africa announces that after 13 years, our shortwave broadcasts are to end on Friday 18th July. You have welcomed us into your homes since our first shortwave broadcast on 19th December 2001. Our broadcasts will continue on our website, via Channel Zim through TV decoders, and by various other forms of new media. We know how much these shortwave broadcasts have meant to our listeners in more remote areas who have so little access to news and information, and we sincerely regret that we will no longer be able to provide this service. We would like to thank our listeners who have been such loyal supporters for so many years and also for their willingness to share the stories of their lives with us on our Callback program. This has allowed people all over the world to have a better understanding of the many crises that Zimbabweans continue to face. We can only hope that one day, sooner rather than later, there is real media freedom that allows Zimbabweans, wherever they are in the country, easy access to what is a basic human right – freedom of information and expression." it is Maintenance day at our transmitter site. GREECE    Updated summer A-14 shortwave schedule of ERT Open from July 4.
schedule. NOTE: All frequencies are not registered in A-14 HFCC database. 1600-1730 NF  7510 TAC 100 kW / 065 deg to KRE Korean, ex 7530. Radio France has decommissioned the first three of of its mediumwave transmitters. Last Wednesday, three high power AM stations of France Info, the news channel of the public broadcaster, were switched off. France Info is currently available in France on more than 260 FM frequencies. Nevertheless there are still areas where the station is not well-received on FM. Therefore France Info also transmits through various high power mediumwave transmitters. In NE France, Nomeny 837 kHz 200 kW, located north of Nancy. In Central France Nieul 792 kHz 300 kW, north of Limoges. In the south, Muret 945 kHz 300 KW, SW of Toulouse. The other high power mediumwave stations of France Info,as well as the mediumwave transmitters of the local network France Bleu, are still on the air. For listeners in the affected areas, the elimination of AM stations means receiving France Info in some places over the air is difficult or even impossible, requiring manual switching between different AM frequencies. DAB+ is not an alternative, as Radio France has already decided not to invest in digital terrestrial radio. After the summer station operator TDF will dismantle the mediumwave transmitters in Nomeny, Nieul and Muret. What will happen to the towers is still unclear. Radio France is not the first public broadcaster in Europe to switch off mediumwave. Previously, public broadcasters in Norway, Denmark, Flanders, Switzerland, Hesse, SouthWest Germany, Central Germany and Bremen turned off their AM stations. In the Netherlands it's planned to turn off the mediumwave transmitter of Radio 5 in 2015, but an official notice has not yet been released. * Eternal Good News, no signal on July 13. A new AM station has begun broadcasting in the Czech Republic on 981 kHz. Local DXer Karel Honzik heard the station on June 27th using FM modulation. The signal is aired from the same antenna as Radio Dechovka on 1233 kHz, located in Prague.